The plan you see below is based on the “suggested plan of interments in the chancel” from Doyne C Bell’s 1877 book “Notices of the Historic Persons Buried in the Chapel of St Peter ad Vincula in the Tower of London” which is a record of the restoration work carried out on the chapel in 1876 and 1877. The Victorian workers were responsible for laying the tiled floor in the chancel and marking the burial sites with the memorial tiles which can be seen today. The plan is based on the Chapel’s records of burials and remains found during the work. I recently visited The Tower of London and saw a plaque on the wall near the door with the name dacre on it – I didn’t have time to read it properly. I live near herstmonceux in East Sussex whosw castle has connections with the darcre – can you tell me about the darce whise placue it was? Can you please tell me if Lord William Boyd, 4th Earl of Kilmarnock, is buried in St. Peter’s Chapel in the tower? If so, is he in the wall? My family has different stories about where he is buried. It’s really too bad they can’t find descendants of Mary Boleyn or her siblings and do DNA testing on the remains they believe to be Anne’s and determine which ones are hers. Mary’s children, Henry and Catherine, are buried in Westminster Abbey so it could be done but it would be such a shame to exhume them all and cause damage to the floor at St Peter ad Vincula and the tombs in Westminster Abbey. it is not necessary to find the descendants as long as they can exume anne´s father or mother and take some few miligrames of sample for the dna. it is just a comment as i dont know if her parents´graves can be found. We know where her parents are – Thomas is buried at St Peter’s, Hever, and Elizabeth is at St Mary’s, Lambeth, now The Garden Museum. 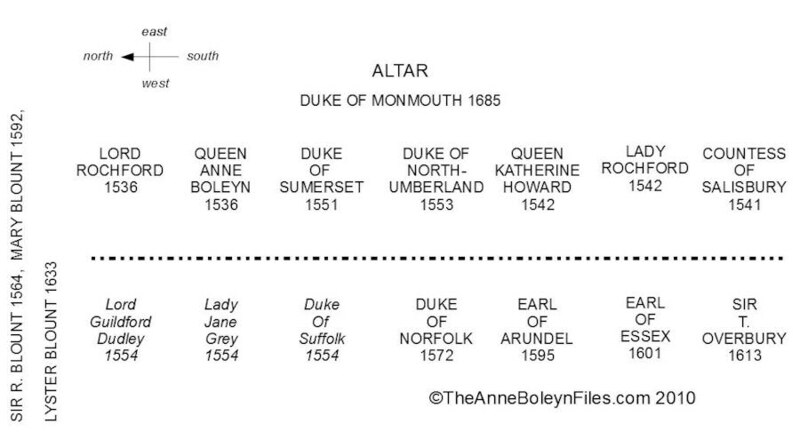 According to Ancestry.com, and records, I am a descendant of Mary Boleyn. While visiting the Tower last year, I was disappointed that I couldn’t see the resting place of Queen Anne Boleyn. I was told that the chapel was closed to the public. No explanation was given. I hope in the near future I will be able to view hers and others without any problems. It’s a working place of worship, so if there’s a special service on it is closed to the public. It’s a shame you missed out. You can join the 40 minute tour, next time you are there, by the Yeoman Warders. This enjoyable tour ends up in the St.Peter ad Vincula church. The time in there is limited, places & points of interest are shown and then it’s out folks! No wondering around! So that is disappointing to say the least! If you go for the whole day then you can hang around and visit the chapel towards the end of the day when they open it to the public after the Yeoman Warders’ tours have ended. That way, you get to visit it in peace and quiet and without being ushered out. Hi Pam. I also visited Anne Boleyn’s grave in the Chancel while on a private visit to the Chapel. The public can take a Yeoman’s tour into St. Peter’s but are not allowed up into the Chancel. Catherine Howard and Lady Jane Gray are also buried under the Chancel. Out of curiousity, where’s Thomas Cromwell buried? I thought it was here; however, he was executed in 1540. Cromwell was also buried at St Peter’s, but in an unmarked grave. Would Queen Anne Boleyn be deserving of a current day pardon? Can our current monarch rule such action? There is no need for Queen Elizabeth II to issue a pardon as it is well documented that Anne Boleyn was not guilty of treason as charged. Gulity on trumped up charges. I visited St. Peter’s today to research Queen Anne Boleyn for my work at the Westminster Abbey education centre. The Canon responsible for the safe keeping of the tombs showed me around and told me that there is no mistake as to where the Queen is buried. She is in a vault under the Chancel and was buried according to her wishes, with her head held firmly against her body by her arm. She was buried in the gown she wore to her execusion. The only uncertainty is whether or not she still had her finger bearing her royal ring. That is highly unlikely. Execution victims were usually stripped of their outerwear and their clothes given to the executioner in part payment for their execution. Sir William Kingston, her gaoler, was also reimbursed for Anne’s possessions. A coffin had not been provided for her burial so an elm chest from the armoury, which used to contain bow staves, was used and it would have been very narrow so her gown would not have fit into it and her head was probably just put wherever it could fit. There were no wishes where a traitor was concerned, unfortunately. When the beheaded were buried. Were their severed head placed with them? We’re they buried in anything or just placed in the have earth? I am searching for photos or you tube film of burial location of sir George Wharton 1st Baronet who is buried here. Is the spy “Willem Johannes Roos” executed in 1915 in the Tower buried in St Peters chapel, if not, then where? No, the spies who were executed were buried in Plaistow Cemetery, Newham. Thank you, I will try to find his grave if its there. I have the same naam but as far as i kan find out up to now he is no close family or relative.